JEFFERSON CITY, Mo. — The Missouri Department of Natural Resources has developed a new green infrastructure guide for municipalities and community development professionals in Missouri and the midwest. The Missouri Guide to Green Infrastructure: Integrating Water Quality into Municipal Operations provides a general overview of green infrastructure for stormwater and energy management, whole-life costs and the triple-bottom line benefits for social, economic and environmental interests. The guide also provides a how-to approach to site design and implementation strategies, champion projects, local codes, ordinances and policies - all in a manner that provides a level playing field and equitable incentives for developers and taxpayers. As Missouri and the rest of the country move toward environmentally compatible approaches to infrastructure planning, the Missouri Guide to Green Infrastructure will provide municipalities and regions with a roadmap to implement sustainable stormwater management practices to improve water quality, relax financial burdens and provide recreational opportunities. 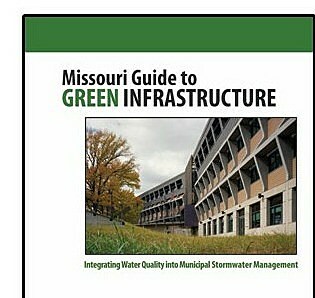 The Missouri Guide to Green Infrastructure: Integrating Water Quality into Municipal Operations is available online at dnr.mo.gov/env/wpp/stormwater/mo-gi-guide.htm. For more information on stormwater control, call the Department of Natural Resources’ Water Protection Program at 800-361-4827 or 573-751-1300.